The PCs' minis, with upgraded equipment (L-R): Jumari, half-orc inquisitor; Jubair, human rogue; Fatou, human wizard (with owl familiar Nochaesh); Lucretia, half-elf monk (zen archer); ZhzZha, half-orc cavalier; and Edel, elf bard. The party spent some time discussing whether to press on or withdraw to rest. The inquisitor Jumari convinced the rogue Jubair and wizard Fatou that they needed to finish clearing the tomb of any possible trace of the death cult, and the rest of the party somewhat reluctantly followed along rather than splitting their forces. Jubair scouted ahead into the tunnel out of the last room. After a short distance, he caught sight of a pair of cat-sized beetles that glowed with a sickly greenish light. When he returned to report to the party, he was uncertain whether he had actually seen these "ghostly beetle things, with whiskers," or was merely hallucinating from the poison from the iron cobra. He wondered aloud whether the entire party was hallucinating--perhaps they were still outside, in the sandstorm? His strange behavior convinced the group to retreat upstairs, report to their employer and the rest of the caravan, and get some much-needed rest. The party took turns standing watch in the room with the trapdoor to the lower level, with Jumari sleeping upon the door itself. Before going to sleep, Jubair proposed to the cavalier, ZhaZha, that they find a way to bring her war-trained camel with them, which led to an unproductive (but humorous) discussion of how to fit a camel through a door sized for a person, then safely down the ladder to the floor below. Their conclusion was to not annoy the camel. The sandstorm arrived soon afterwards, and the caravan spent a noisy night sheltering in the tomb. The winds were still blowing in the morning, when the party prepared to return to the lower level. This time, two ghostly beetles were near the breech into the tomb's worked spaces, and immediately attacked the party when they reached that entrance. One was quickly dispatched, leaving nothing behind but a puddle of disturbing slime behind. However, two more arrived--one of them passing straight through the wall and attacking Fatou. Jumari recognized the bugs as being some sort of ectoplasmic creatures--not quite ghosts, but not fully solid, either. Her falchion easily cut through two of the insects, but not before ZhaZha, Jubair, and Fatou had fallen from nasty bites. The bard Edel healed the first two, then Jumari pulled out some scrolls to assist him. Once everyone's wounds were attended, the group continued down the earth and stone tunnel, which led through a series of small chambers to a dead end. From the muffled sound of blowing winds, they guessed that this room was near the surface of the rock wall from which the tomb's entrance was cut. After some searching, the monk Lucretia found a boulder-like slab that formed that secret door. Due to the raging storm outside, they left that door closed for now. The party returned to the worked portions of the complex, and gave every room a thorough search, but found no more rooms or treasure. During this time, Jumari, Jubair, and ZhaZha decided to return to that last secret door. The overly-inquisitive inquistor opened it, and received a faceful of sand as a reward. The brawny cavalier shoved the door closed before too much sand blew in to prevent its closure, and they returned to the upper level to wait out the storm. Fatou took this time to use mending on some of the shards of obsidian from the shrine room, in an attempt to piece together what the cult object had originally looked like. She was able to reattach some of the largest pieces, but the smaller shards proved too much of a puzzle. Jumari, however, could now see enough of the shape to conclude that it had been a statue of some wraith-like figure--clearly another symbol of the death god Asmolon. When she asked why the wizard was trying to repair this unholy object, Fatou tried to explain her interest in learning about their enemy, but ultimately ended up stopping and bagging up the remaining pieces. The evoker then started working on a map to this place, so that she could inform her goddess's temple of its location so that it could be properly purified at some future date. The storm stopped soon afterwards. Once the caravan cleared sand from the exits, they were able to continue south to Zahallan, which they reached two days later. 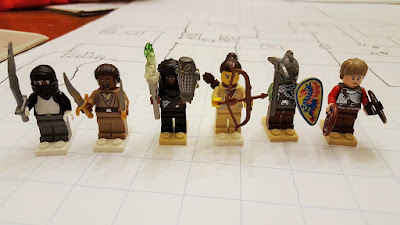 All six fledgling heroes decided to part ways with the caravan there, and collected their final pay from Lucan Midorichal. The party also sold much of the gear that they had taken from the tomb, and from the orcs they had fought a few days before then. Having agreed to keep working together, they pooled their new funds to purchase a wand of cure light wounds for their communal use. Edel was chosen to carry this item, which would allow him to continue to serve as a healer while freeing up his own precious few spells for other purposes. Fatou announced to her new friends that she planed to spend some time studying at the temple, and asked that they not leave her behind. She did not, however, explain her plans in any detail--which led the ever-paranoid Jumari to fear that the wizard's keen interest in Asmolon's relics meant that she wanted to join that god's cult. She mentioned this theory to Jubair, who, as an amateur conspiracy theorist, swallowed the idea whole. However, when the rogue repeated it to ZhaZha, the cavalier told him that the idea was ridiculous. She also assured him that Jumari couldn't be one, either. This left the poor rogue very confused. He ultimately concluded that none of his new friends could be death cultists, because none of them were boring enough to be such awful people. Jubair spent the next few days visiting his relatives in town. He is an orphan, but has an uncle and aunt in Zahallan who help him out from time to time when he takes breaks from his solitary life in the desert. Edel took this time to track down a Fendorlian elf family he had learned about when the caravan was last in Zahallan. Laeroth Virren lived in a modest home near the city's East Gate. Part of the building also served as a bowyer's shop run by his daughter Naladella. This elf woman turned out be a tough-looking warrior bearing the scars of old battles. Edel perused her wares, and found an elven-styled shortbow that suited him well. As they discussed his purchase, he asked if she had news from their homeland. His pleasant manner and appreciation for her craftsmanship caused her to open up readily, and she explained that she and her father had left Fendorlis during the Zolothi conquest (when dragon-led kobolds overran the high elf kingdom--the same invasion that caused Edel to leave home). Her father Laeroth was a spellcaster who, despite the distance, had the means to keep in touch with contacts he had made before the diaspora. She rarely heard much of that news herself, as she was the pragmatic one of the family, focused on making a living here. Edel asked if he could meet her father, and she agreed, instructing him to come back when the shop closed for the day. After a few days, Lucretia visited the temple to check on Fatou, and learned that the young wizard was studying to become a cleric of Yaziel, just as her late mother had been. Fatou asked the half-elf's advice on what to do about the unholy scripture they had found in the tomb. The monk recommended that she leave it with the elders of the temple, so that they could study it and dispose of it as they saw fit. This matched Fatou's own thoughts, so she took it to the halfling mullah, Jenana Nasrud. She explained how she had acquired it, and shared her thoughts about studying it in order to better understand and fight the evil cult. The mullah commended her instincts on the matter, and thanked her. Nasrud promised to study it further, and assured Fatou that, even though such works were forbidden by holy law, the best place for them was in the hands of the priests of the Mistress of Secrets. Lucretia visited her friend again a few days later. This time, Fatou asked her to arrange for a letter to be sent to her father, Zarqa Damiri, in Almazur. Lucretia knew that Lucan Midorichal would be leaving town soon to return to the Shield, and would pass that way, so agreed to ask him to deliver it. [The monk had letters of her own to send back to her contacts in the Shield through him, so this errand was no burden to her.] Fatou revealed that she had left home without telling her father. Both her parents came from magical lineages--her father administered a school of magic, and her mother had been a priestess of the goddess of magic. After her mother's death, her father had pressured Fatou to follow his path, but she felt drawn to her mother's calling as well--and now that she had left home, she had the chance to do both. The PCs are now second level, and all but Fatou will be continuing in their original classes. We have some additional downtime activities to conclude over email before our next session--including some additional shopping, Edel meeting with Laeroth Virren, and Jumari hunting around town for traces of the Asmolon cult on her own. Depending on how extensive all that is, I will either repeat the highlights at the beginning of my next session summary column, or write it up as a separate "interlude" post. Also of note, Jumari has yet to share her own religious affiliation with her new comrades. They know only that she can cast divine spells, presumably with no obvious holy symbol, but do not know that she is an inquisitor. We expect some further discussion of religion to occur once the rest of the party learns about Fatou's changed status. If nothing else, the newly-minted cleric is extremely curious about what exactly Jumari is! 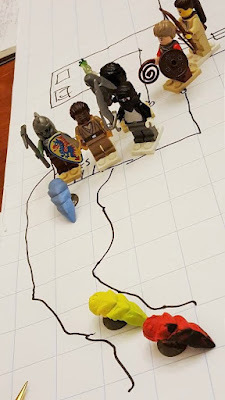 For this adventure, I used The Desert Tomb, a map from the Dyson's Dodecahedron blog, as a starting point. I redrew it to fit onto a more easily drawn grid, then populated it with monsters and treasure.